Sand castles! Always one of our favorite activities when we come to the beach. Or is it? We always have this romantic idea of all sitting together in the sand building a giant sand castle – with towers, and walls, and seashells decorating the entrance to the castle. But…for us, it never turns out that way! First of all, it seems that every year, on the day we decide to build our obligatory sand castle, there is not a hint of a breeze, and the temperature is sky high! Not sure how that happens every year, but it does. Is he secretly competing with the other dads on the beach filling buckets with wet sand and carefully sculpting moats and towers? Or is he doing it for Zach and Morgan? I guess it doesn’t matter. 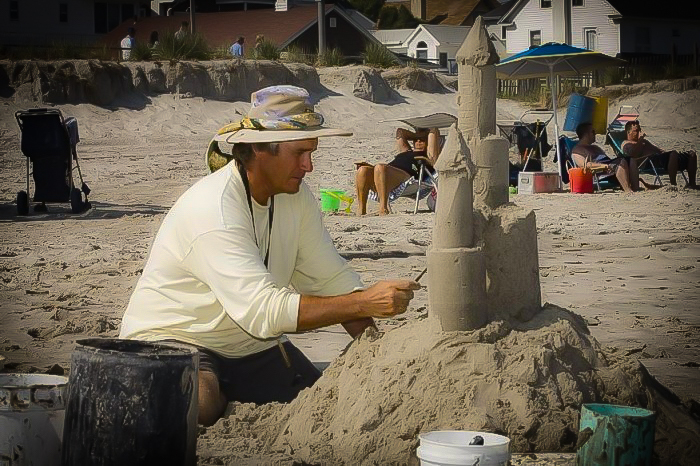 The kids love whatever he builds every year – he is the “sand castle master. But even so, they are only interested in helping him with this project for about a total of 5 minutes, then they run off to splash in the water, and Daddy is on his own! 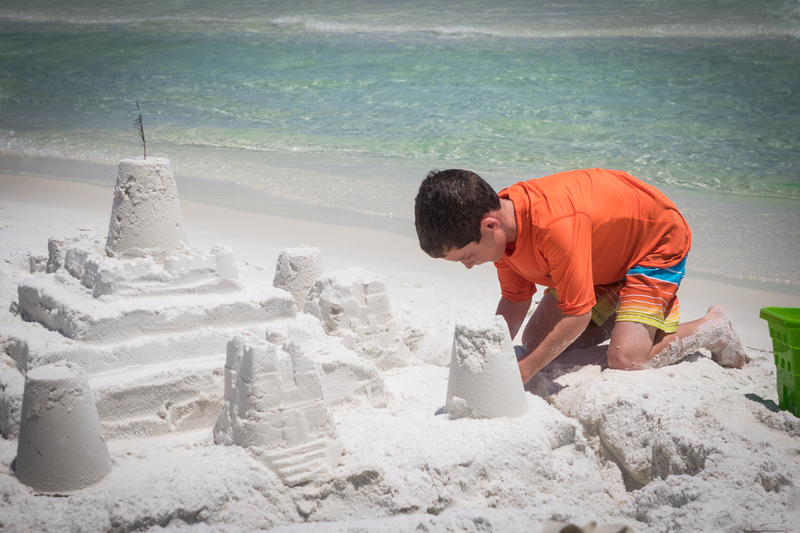 Believe it or not, there are lots of helpful articles on building sand castles! Unfortunately (or fortunately), I did not read any of these article before our trip. So I was not much help at all in the designing department. Darn! 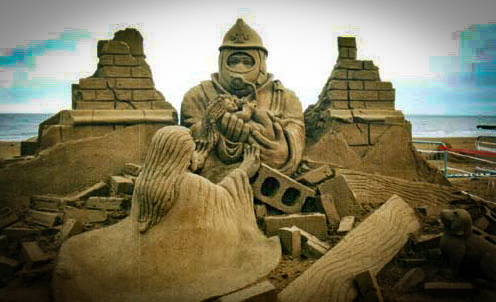 There are some very serious sand castle builders out there. Ever hear of the magazine Popular Mechanics? Well…even they have an article on building sand castles. Their article is titled Build A Great Sand Castle – How To Get Started. And if you are not a fan of Popular Mechanics, how about Martha Stewart? Yes…even Martha has an article on building sand castles… Really?? Of course, that doesn’t really surprise me – she knows everything about everything! Right? Martha suggests that you need a sand castle tool kit for your beach trips! Oh my… One of her articles says “The beach is the perfect place to indulge any hidden architectural impulses. A little wet sand is just right for building a simple castle, an intricate palace, or even something more exotic such as a human figure, a face, or an animal. But to do the job right, you’ll need to equip yourself with the proper equipment, including lightweight shovels, such as feed scoops; a bucket; funnels to create a roof for the castle’s top; putty knives for fine detail work; brushes; straws for blowing sand out of tight spaces; ice pop or craft sticks; and a pouch in which to keep it all. Look for all these items at hardware, toy, or pet stores.” Can’t you totally hear her saying that? I thought maybe this was a joke, but after reading more about these serious castle builders, it doesn’t seem so crazy to have a straw in my sand castle building kit. Because you never know when you might need to blow sand out of a tight space! 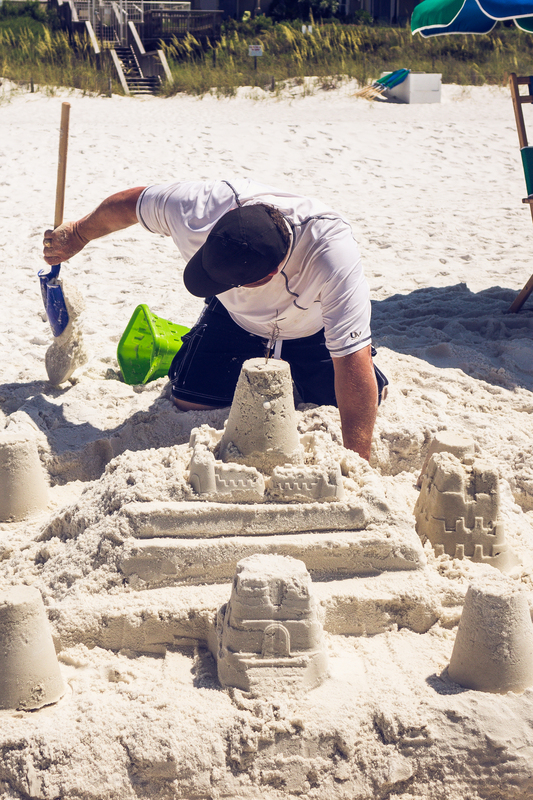 In her article titled How to Build a Sand Castle, she takes you through many steps she believes you need to follow to be successful in sand castle building. She talks about 14 steps needed to build a proper sand castle, and she doesn’t even get to actually building the castle until step 8. Clearly, she hasn’t been to the beach with small children. There are no “steps”! And there certainly isn’t time to “sketch” your castle out on the sand. At least not with my crew. They immediately begin to dig and build – no plan in mind. They don’t spend any time thinking about what it will look like in the end – it’s just crazy digging and filling buckets with wet sand to make towers! John Gowdy working on one of his many castle sculptures! If you prefer to watch a video to learn how to build a proper sand castle, then guess what…Martha (and many others) have a video for you also. In this video from Martha Stewart called Sandcastle Sculptures, she interviews John Gowdy – a fireman who is a world class sand sculptor on the side! And all I can say about this video is WOW! Totally worth watching. John Gowdy grew up playing and building castles on the beaches of Atlantic City. As an adult, he became a fire fighter. He is a captain at his fire station, where he stays very busy, but he uses any down time he has to design his sand sculptures. He now incorporates fire fighting themes into his sculpting also. And would you believe that he practices his sand sculpting in a giant sand box that he has in his own backyard? There are lots of sand castle kits available out there, and Martha Stewart has a great list of items that she thinks you need. But check out this article I found on Pinterest by Molly Zisk at the Orange County Register! She suggests several items for your sand castle kit that most people keep in their kitchen. There are several options out there to buy – from very cheap to very expensive. Guess it depends on how serious you are about your sand castle. Do you want yours to be the best on the beach? If so, I suggest the Sand Castle Kit with Forms and Tools. This thing comes with a mold for tall towers! Nice, right? I prefer the second option, because if you have spent any amount of time at the beach, you know that a mesh bag for sand toys is priceless!!! And guess who forgot their mesh bag this year…ME! Total pain to rinse each toy off individually – usually I have a mesh bag and I just blast all the toys with the hose while they are in the bag. So…whichever option you choose, don’t forget your mesh bag! Here’s Zach helping out with our annual project – I think he worked on the castle for about 10 minutes this year. And it’s usually his idea to build one in the first place!